The bacterial species Salmonella enterica can be found in multiple animals such as poultry, pork, bovines, and reptiles, without making them sick. It is transmitted to humans through the consumption of contaminated food, most of the time eggs, meat or milk. It can also be transmitted by drinking water contaminated with animals poop. Cooking usually eliminates it and its proliferation is repressed if the products are kept in the fridge. Raw eggs, the risk is egg-spress! Every meal made with raw eggs presents a high risk of Salmonella enterica infection. 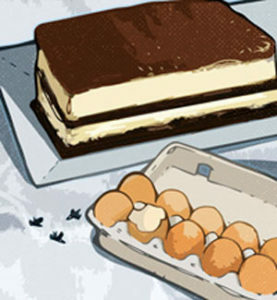 Therefore, try to use fresh eggs to prepare your mayonnaises, chocolate mousses, tiramisus and other deserts and keep them in the fridge if you are not going to immediately eat them. Do not eat raw cookie dough, as it contains raw eggs, even if made from scratch with fresh eggs it is still risky. 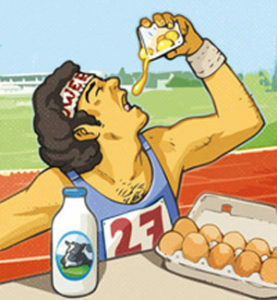 If you straight up eat raw eggs, make sure they are truly fresh! Salmonella enterica can cause diarrhea with fever, stomachaches, vomiting, and nausea. Salmonellosis is not a very serious disease: usually contaminated people will spontaneously get better. An antibiotic1 treatment is not required in most cases. Each year, 1’200 to 1’500 confirmed cases of salmonellosis occur in Switzerland (numbers from FOPH 2017), making it the second leading cause of gastroenteritis2 due to a bacterium, after Campylobacter jejuni. If the diarrhea is important, the patient can quickly lose a lot of water and is at risk of becoming dehydrated. This is a big concern for young kids and elderly people. Treatment should focus to give enough water and mineral salts, as found in rehydration solutions or powders available at grocery stores. Antibiotic1 = A drug which allows to kill bacteria or at least to stop their growth. Antibiotics act against bacteria, but do not help treat diseases caused by viruses and parasites. Gastroenteritis2 = Infection of the digestive tract affecting both the stomach (from the greek « gaster ») and the intestines (from the Greek “enteron“). Gastroenteritis can be of viral origin (due to enteroviruses for example), also called « stomach-flues » or of bacterial origin (due to Campylobacter jejuni for example).